It is an approach to managing a company's interaction with current and potential customers. It uses data analysis about customers' history with a company and to improve business relationships with customers, specifically focusing on customer retention and ultimately driving sales growth.Customer Relationship management is the strongest and the most efficient approach in maintaining and creating relationships with customers. Customer relationship management is not only pure business but also ideate strong personal bonding within people. Development of this type of bonding drives the business to new levels of success. 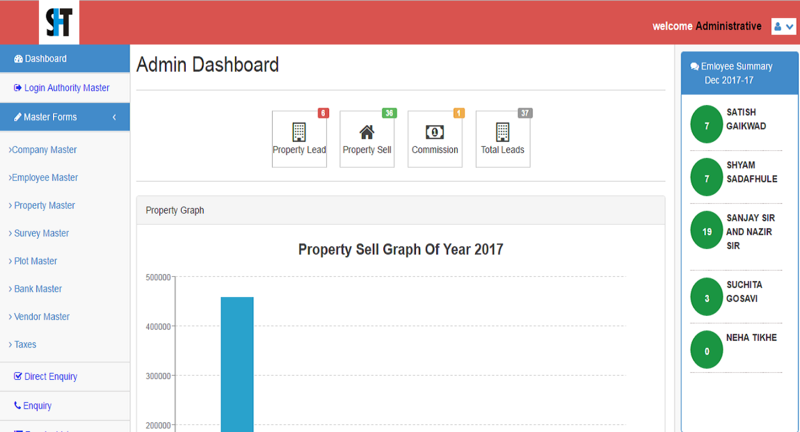 The "Dashboard" is displayed on a web page that is linked to a database which allows the report to be constantly updated.For example dashboard may show numbers related to productivity such as number of produduced units, or number of failed projects per hour. 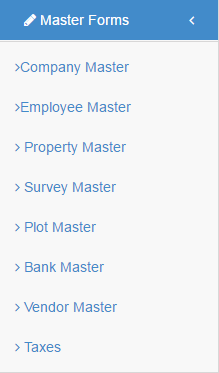 Master Forms consists of various forms like Company master which shows the information about the company, Employee master which gives details about employees of company and their tasks, Property master which gives the number of properties we have, Survey and Plot master shows th esurvey no. and plot no., Bank master shows the overall transactions with various banks, Vendor master shows the list of vendors, Taxes shows the taxes to be paid like GST,Service Tax. Direct Enquiry gives a form to the direct visitors to the office. Enquiry master gives the various enquiries for our services it shows the enquiry and the task assigned to particular employee. 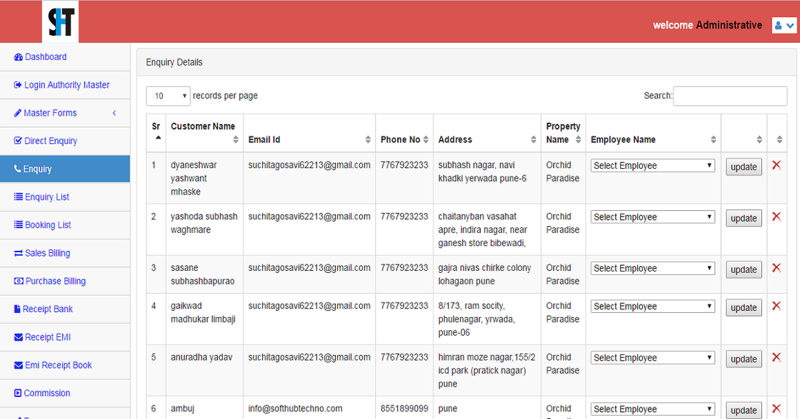 Enquiry list shows the overall enquiries in list wise manner. Sales, gives the details about the sales and their billings. Booking shows a booking form. 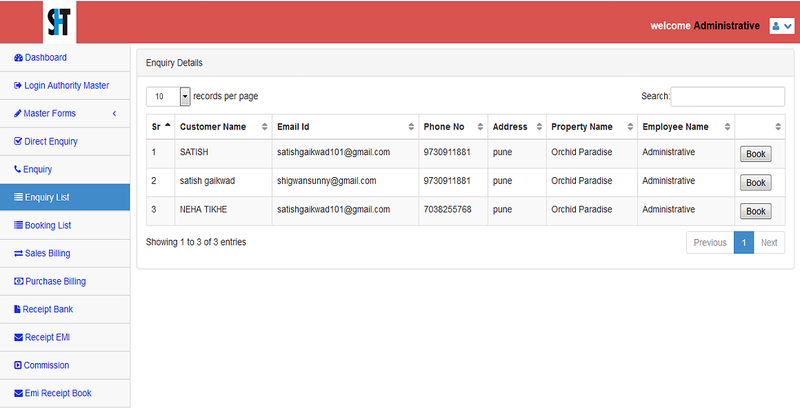 Booking list gives us the details about the all the bookings which are done. Cancel booking shows the booking list and we can cancel any of the booking at any time. 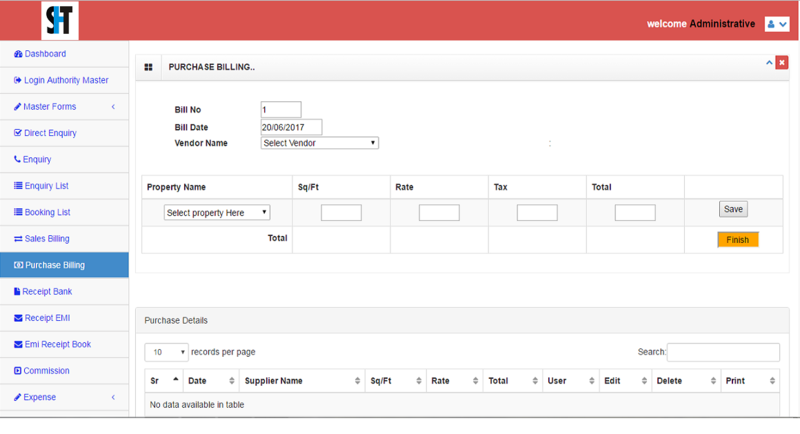 Purchases gives the purchase list and billing of purchases. Accounting consists of the information about receipt bank, receipt EMI, etc. Softhub Technologies is a Software Development,web design company based in Pune. Our team comprises designers, programmers, testers and content writers. We understand that not all our clients are tech savvy, and gently guide them through the ever changing realm of the internet to their desired destination. : Office No. 14, 5th Floor,Bhosale Shinde Arcade, JM Road,Deccan,Pune-411004.